Designer Marcia Bales, who's interest is archaeology, had designed puzzle games before, but not an adventure game, so Roberta Williams helped out as creative consultant. Marcia, who loves traveling, had originally planned to put the game location on various archeaological sites. Roberta however suggested to change the location to a confined place, such as a haunted house, which is where Marcia came up with the idea of a museum. It seems Roberta really liked haunted places because she was at that time still working on Phantasmagoria. The idea of the Ixupi also comes from Marcia, who had done a lot of research on South American archeaology and combined it with a range of traditional ghost stories: vampires, shape-shifting creatures, and creatures related to the elements of the earth. That is also how Egypt came into the equation, as Egyptians believe that a person consists of different aspects: the body, soul, intelligence and life essence. Most of the items in the museum are factual and based on Marcia's travels and research in different parts of the world. In fact, the movie sequence in the museum's theatre partially consists of Marcia's own footage of Mayan ruins and pottery in Belize. The remaining part of the museum is sprouted from the minds of the artists. Marcia gave them a free hand with their designs with the purpose to have some strange non-factual things in it, much with the intention to reflect professor Windlenot's theories, which are often totally off the facts. 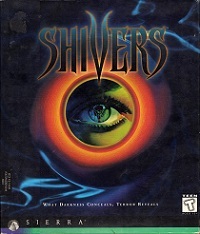 Shivers differs itself from other adventure games because of the random play: puzzles can be solved randomly, the museum can be explored randomly and the facts of the story reveal randomly. Marcia based this on the concept of the game Mixed-Up Mother Goose, designed by Roberta Williams and later remade by Marcia. Ron Spears, the art director of Shivers, followed Marcia's vision, creating illustrations, concepts and artwork, and lead a team of 2D and 3D artists. Each artist got a museum room assigned, following the concept art and ideas of Ron, to work it out in detail. Ron then made sure that the different rooms were consistent with eachother so that the museum would not look fragmented in style, but a lot was already predefined by him, such as the textures of the walls and floors. The rooms were built with 3-D Studio (TM), a 3-D environment on the PC, placing walls and such, adding colors and textures, and making countless shots with a camera from different angles and with different light positions. Guy Whitmore, the composer and sound designer for Shivers, was in charge of most audible stuff in the game: he composed the music, designed the sounds, recorded the sounds, edited the sounds, nearly the whole package. The music in Shivers is very diverse, ranging from traditional to pop and rock styles, but dark ambient music dominates most of the game, adding to the atmosphere of the different rooms. Many of the sounds, such as slamming doors and the like, were taken from a sound CD and edited for enrichment. The actors were used to record additional voices, roars and screams, particularly narrator Rodney Sherwood. Willie Eide, the lead game developer, got all the material from the designer, sound designer and art director, and merged them all together into one game, using Sierra's SCI-32 engine. He also added a few personal touches, such as sound fading and several of the riddles in the game. He also added subtitles and was responsible for debugging. Tony Ober, director of photography, was responsible for the movie sequences in the game, recording the actors on blue screen and inserting them in the game environments. He was also the cameraman. Wendy Albee, producer of Shivers, oversaw the entire team to make sure everything ran smoothly. She picked the people for the different jobs, contacted agencies for actors, decided on how it would be made (2-D and 3-D modeling), that the people had the equipment they needed. She also dealt with the budget, marketing and sales and was the main liaison to corporate and general management, reporting to manager Lynn Luukinen and Sierra CEO, Ken Williams.